The cost of hiring an attorney to represent you in a bankruptcy filing can be prohibitive if you are drowning in debt and have few liquid assets. Depending on your financial circumstances, you might be eligible for pro bono legal assistance at no cost from a variety of sources. Many law firms dedicate attorney time to aiding needy individuals. Additionally, law schools, attorney bar associations and legal aid societies provide free clinics and legal services to financially needy clients. Research options for pro bono legal services in your area. Contact your state and county bar associations' lawyer referral networks. 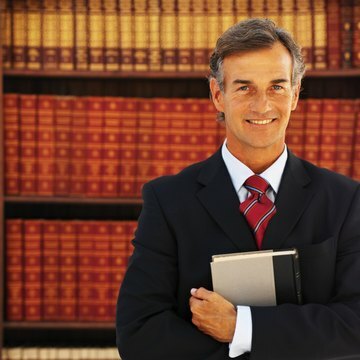 Many professional lawyer associations compile lists of attorneys who provide free legal services. You may also call the intake department of law firms in your city and ask for a referral for pro bono representation. Some law schools offer free student law clinics, which may be able to provide free legal services and guidance in your bankruptcy filings. Collect documentation demonstrating you meet income guidelines required for free legal services. Legal aid societies and student clinics generally restrict free services to applicants whose income is less than 125 percent of federal poverty levels. Additionally, most attorneys will not offer pro bono representation to potential clients who are otherwise able to pay. In order to verify your eligibility, these legal service providers will likely request copies of recent pay stubs, previous year's federal tax return and a copy of your credit report. Schedule an initial consultation with potential legal representatives. During this first meeting you should be prepared to answer questions about the reasons you want to file for bankruptcy and what you hope to accomplish. This meeting helps the attorney determine whether he is willing to offer representation based on your qualifications and the circumstances of your case. You may need to schedule meetings with several pro bono service providers since different providers may have different eligibility requirements. What Things Should You Bring to Your Lawyer for Bankruptcy? Do You Need an Attorney to File Chapter 7? If you are facing a mountain of debt, you may conclude that you'll never be able to repay everything you owe. Filing a petition for Chapter 7 bankruptcy might be the only way out, but the cost of an attorney could be holding you back. It is possible to file Chapter 7 bankruptcy without an attorney, although attempting to do it on your own is unwise. Fortunately, help is available and it may be more affordable than you think. Divorce has the reputation for being messy, costly, time-consuming litigation, and sometimes that is unavoidable. You’re often fighting for the things that are most precious to you, like your children. Not everyone has the income to fund such a battle, however. Thanks to a variety of resources, low-cost and no-cost legal aid is available in most states, but you must usually qualify for it. Bankruptcy is a legal status for which individuals and businesses may both file. Ultimately, individual debtors and companies choose to file bankruptcy when they are unable to repay their debts. Common types of bankruptcy for individuals include Chapter 7 bankruptcy, which requires debtors to liquidate assets to cover their debts, and Chapter 13 bankruptcy, which creates a structured repayment program. Chapter 7 bankruptcy also creates a reorganization plan for qualifying businesses. What If I Am Unable to Pay for a Bankruptcy Lawyer? Can I Get Legal Aid for Bankruptcy in Ohio? Can You Obtain a Legal Aid Lawyer for Divorce in New York?